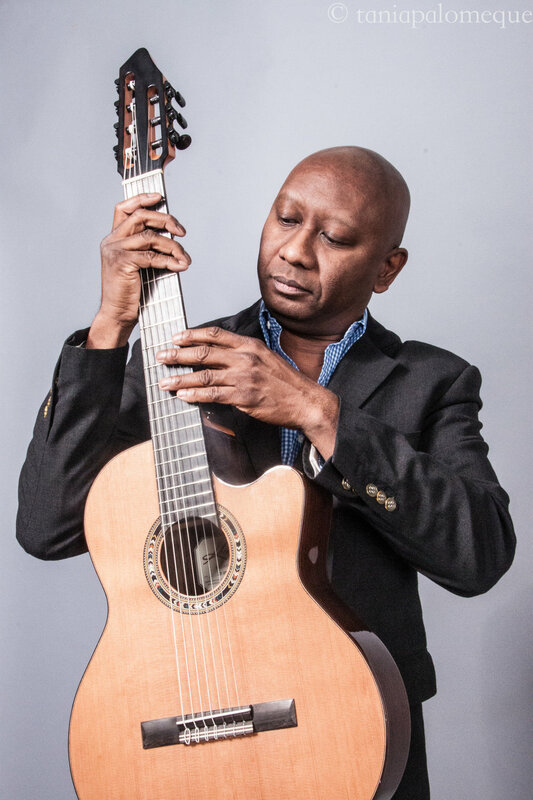 Versatile and sophisticated 7-string guitarist Ron Jackson has performed, recorded and taught music in over 30 countries. Highlights include shows and tours with artists such as Taj Mahal, Jimmy McGriff, Larry Coryell, Benny Golson, Oliver Lake, Russell Malone, Randy Weston, and Mulgrew Miller. Ron has been featured as a leader in jazz festivals all over the world, including the North Sea Jazz Festival, Edinburgh Jazz Festivals and Winter Jazzfest, NYC. Ron was grateful to be selected as the winner of the 1996 Heritage International Jazz Guitar Competition. He has also been a recipient of the 2012 Donald Knutson Memorial Development Fund and the 1991 and 2000 Meet the Composer Performance Fund. He endorses, Eastman Guitars, Kremona Guitars, Aria Classical Guitars, Paul Reed Smith Guitars and Godin Guitars. An acclaimed music educator, Ron currently teaches guitar at Jazz at Lincoln Center, The New School, Midori and Friends, and is the founder and director of the website www.practicejazzguitar.com. Ron has held master classes, concerts and workshops at Jazz at Lincoln Center-Jazz in the Schools, The Thelonious Monk Institute of Jazz, Escuela Creativa Musica in Madrid, Spain and California State University. Ron has made appearances in several major motion pictures including The Greatest Showman, Vulgar, and Fly by Night. He has also performed in pit orchestras on many Broadway and off-Broadway shows including Avenue Q, Fosse, Shuffle Along, and Bring In `Da Noise, Bring In `Da Funk. In recent years, Ron has also developed a side career as a freelance writer for Acoustic Guitar magazine where he’s published educational and guitar instructional articles. The Ron Jackson Trio - "Standards And Other Songs"